Its volume would contain 1,304,000 Earths. The Sun’s mass is 1,989,100,000,000,000,000,000 billion kg or 333,000 Earths. This is 99.86% of the total mass of our Solar System, about three quarters of this mass is hydrogen and the rest is mostly helium with much smaller quantities of heavier elements, including oxygen, carbon, neon and iron. Suns surface gravity is 28 times that of Earth. Size of earth (12,742 km dia) compared to a solar flare https://www.youtube.com/watch?v=HFT7ATLQQx8 at 1.1mins. That’s not science….that’s stupidity. Why is it hot in the tropics & cold at the poles ?….It’s the sun, stupid. The Sun heats the Earth; when its radiation increases, the Earth warms, when the radiation falls, Earth cools. • The earths surface is a giant solar energy collector, any fluctuations in solar output have significant consequences for us. In absolute terms 0.1% variation in solar power corresponds – on striking the earth – to 0.174 petawatts (PW) of incoming solar radiation. That is to say 174,000 gigawatts. To put it in perspective, current total world energy consumption is only around 3,500 gigawatts. I find it sad that so few people seem to have any idea of how trivial we and our planet are in relation to the sun – let alone the cosmos. “Climate scientists” seem especially weak in this area. 1660-1699 Maunder Solar minimum (coldest part of the Little Ice Age). How much of a coincidence is it that these are also the periods of lowest solar activity ?? The Sun has got his hat balaclava on !! 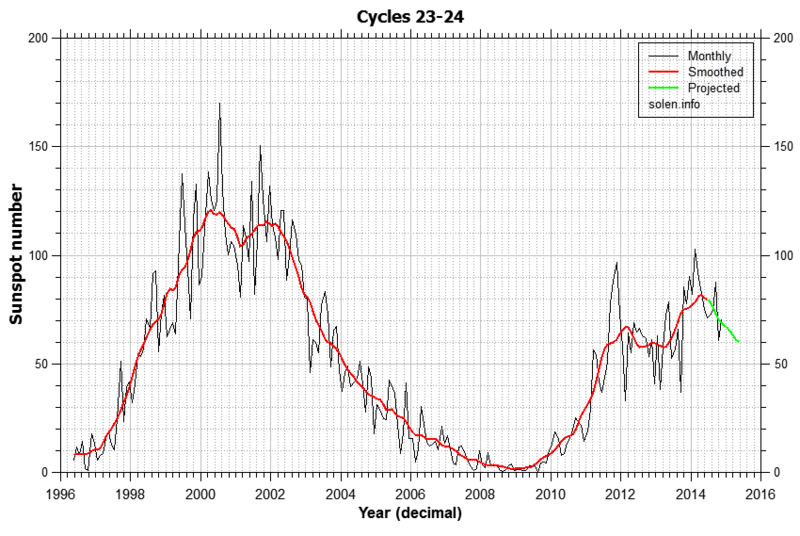 Solar Cycle 23 ending in 2007 was quite vigorous. The present Solar Cycle 24 started 2008 & is on track to be the weakest in 100 years. Solar Cycle 25 starting 2020 is predicted be one of the weakest in centuries. The next Grand Solar minimum appears to be imminent possibly within our life time! See what the Dalton & Maunder Solar minimums did for to us !! The sun undergoes cyclical changes that appear to correlate with earth temperatures. Cycle 23 appears to be the longest in at least a century and may point to quieter subsequent cycles and cooling temperatures ahead. Dec. 21, 2006: Evidence is mounting: the next solar cycle is going to be a big one. 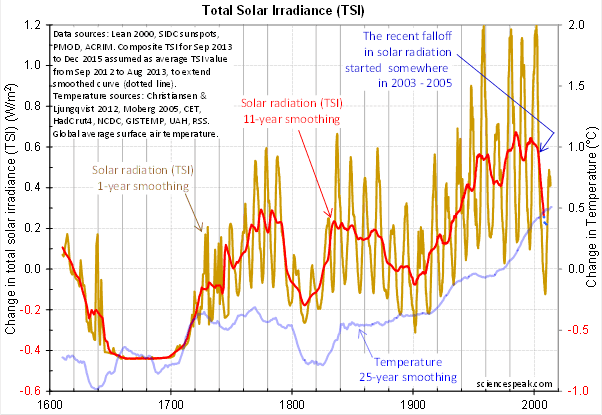 What actually happened – Solar Cycle 24 actually peaked in 2014 & is on track to be the weakest in 100 years !! Two cycles of declining sunspot activity suggest a possible cooling trend. Some open access articles on Solar Flare Observations. PDF Downloads. I found it helpful as a quick update to current theory on solar activity. 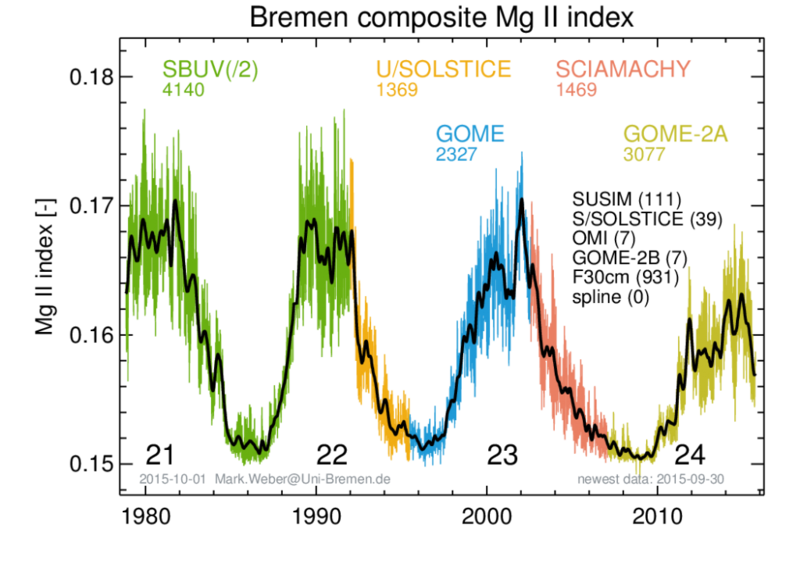 Also, this recent article by David Hathaway of NASA Ames sums up the current theory of the solar cycle and is easy reading. Vahrenholt and Luning show that four concurrent solar cycles control the earth’s temperature. • In a solar eclipse, the air temperature can drop 10 °C in a few minutes & the CO2 in the atmosphere doesn’t do didily-squat to stop the heat loss. If it’s cloudy you don’t see the eclipse it just gets dark, but temperature remains the same, therefore water vapor is the controlling factor, NOT CO2. QED.